One major reason behind frequent clogging of kitchen sink is trapped food particles inside the pipe. And to overcome this problem, we present you our 15 best garbage disposal reviews. Therefore, installing a garage disposal is best way to stop clogging of kitchen sink. By this way you don’t have to ever encounter smelly liquid and food particles floating in the sink. But before we begin with our reviews, we might like to inform you about basic working of garbage disposal. Many people confuse that working of garbage disposal is similar to that of a blender. But matter of fact, they work completely different. While blender makes use of sharp blades to grind food, a garbage disposal uses impellers or lugs. Whenever big food particle enters the garbage disposal, impellers use centrifugal force to churn them into smaller pieces. Therefore, fast rotating impeller along with stationary grind ring churns big food particles. This grind ring almost liquefy food particles so that they easy pass through the pipe. Now that you have brief idea about working of a garbage disposal system, its time to move forward. And by that we mean our best garbage disposal reviews. Our unbiased reviews will certainly help you get best product so that you never encounter clogging of sink. Also buyers guide at the end of garbage disposal system will solve general questions regarding the same. 17.1 1. How to clean garbage disposal? 17.2 2. How to install a garbage disposal? 17.3 3. How to unclog a garbage disposal? InSinkErator Evolution 3/4 HP 34.6 oz. Insinkerator Badger 5 1/2 HP 26 oz. InSinkErator Evolution Excel 1 HP 40 oz. Insinkerator SEPTICASSIST 3/4 HP 40 oz. If you don’t own a garbage disposal, then this product would be the best start. All thanks to its option to select model number. Here model number refers to number of kitchen sink. By entering the model number, Insinkerator says that this garbage system will fit or not. Thus, it reduces hassle of measuring as well as eases your search. Another interesting feature about this Insinkerator garbage disposal is its sound-seal technology. From the name itself you can say that the unit works quietly. And this is possible because of its vibration-reducing connect a quiet collar sink baffle. These together blocks noise coming up through the sink and thus, results in quiet operation. Insinkerator’s 3/4 horsepower motor effectively breaks down large food particles. In addition to that, it features a multi grind technology that grinds food in 2 stages. 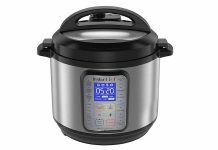 Be it fruit peels, veggies, small bones or leftovers, this unit churns all things very quickly. And due to this reason, it is a best Insinkerator garbage disposal for home use. Furthermore, its quick-lock system makes it easy to switch out one Insinkerator garbage disposal for another. This feature is very beneficial if you’re purchasing the unit for first time. Get your hands on unit with power cord kit. No need to worry about product quality as its stainless steel parts are long lasting. Along with being sturdy, they are resistant to corrosion generally responsible due to hard water. So if your home gets a hard water supply, then this Insinkerator garbage disposal is perfect product. So overall we can conclude that, it is a strong and quality product that will last for years. Bottom Line: With Sound Seal and Muti-Grind technology can quickly grind virtually any food waste. Top rated by more than 2400+ Consumer reviews, it has became the Amazon choice Product. Which means best performance at low price. When size of your kitchen is small, you seek products that need less storage space. And this waste king garbage disposal is perfect for small kitchen space. Despite its compact size, this unit offers powerful disposal. With 3/4 horsepower, waste king helps to keep your kitchen sink clean. Not only that, its sturdy motor effectively churns vegetables scraps, peels, etc in matter of seconds. In addition to that, permanent magnet motor takes up full speed as soon as the unit starts. As a result, it reduces jam as well as helps you to finish the job quickly. And above all, less price of the unit makes it best cheap garbage disposal. Things become much more relaxing if installation is easy. And with such ease, this waste king garbage disposal is fast and easy to mount. The unit comes with all necessary hardware to further ease the installation. Also, it includes a 32-inch long power cord so that you do not have to buy it separately. Moreover, waste king’s shorter running time saves a lot of electricity. Hence, short running times also helps to elongate life of motor. 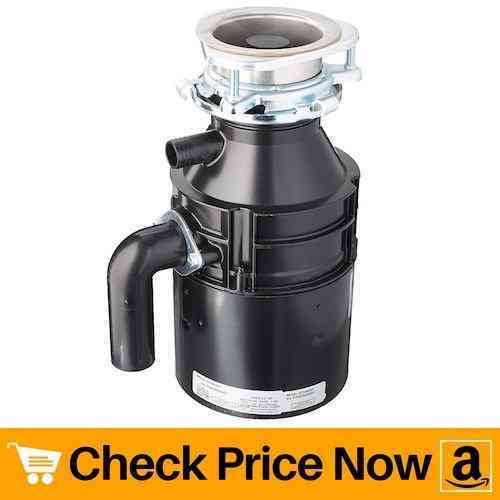 This waste king garbage disposal is also suitable to use with a septic system. However, size of the septic tank should be according to the size of home. Other than that, its corrosion proof polymer grind chamber with stainless steel components are strong and durable. But above all, less price of the unit makes it best garbage disposal under 100. Bottom Line: Waste king is one of the most popular garbage disposal brands in the market on which customer trust a lot. 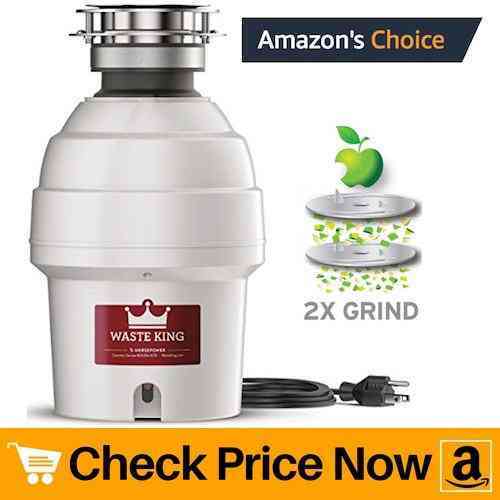 Waste King 9950 with 2400+ reviews has also got the best Choice Product. Our editor like it more than the number one because it is cheaper and have almost same performance. A small family not necessarily need a product having great horsepower. So we present you a small yet durable garbage disposal that is perfect for small household. With horsepower of 1/2, this waste king garbage disposal provides 2600 rotation per minute. And with this much high speed, you can expect food particles to churn at decent speed. Further, its permanent magnetic motor takes up maximum speed in no time. This in turn helps you to get rid of kitchen waste faster. And this feature of waste king L-2600 makes it best garbage disposal for the money. Unlike 3-bolt mount, this small unit have EZ mount system. 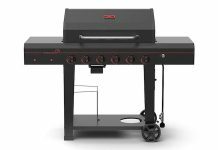 Also, light weight of the product makes it extremely easy for you to set it up. In case you are buying such type of units for first time, then garbage king provides a video tutorial. Therefore, basic plumbing knowledge is more than enough to set this product. Not only that, compact design of the device further eases installation as it can fit in small kitchen cabinet. And due to this reason, it stands as best garbage disposal for small spaces. Waste king’s stainless steel swivel impellers help reduce jamming. Further, its rust and corrosion-proof grind chamber is long lasting. However, this waste king L-2600 does not contain any noise reducing feature. But not to worry as 1/2 HP motor will not generate much noise. Other than that, it is cheap, sturdy and best garbage disposal to buy for small households. Bottom Line: Waste King L-2600 is another excellent cheap garbage disposal for your home from a top brand. Because of the low cost, consumers have loved it very much. 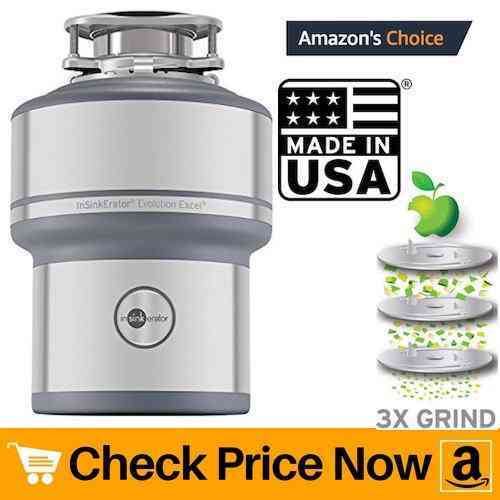 With 3800+ reviews it the an excellent value for money garbage disposal to buy. Single grind stage of this insinkerator badger garbage disposal is perfect for small to medium households. Also, it you do not have much space inside cabinet then small size of this unit is beneficial. Despite having compact design, powerful 1/2 HP motor of insinkerator badger 5 delivers outstanding results. You can throw in vegetables, fruits, peels, eggshells, etc without any second thought. In addition to that, its 26 oz. 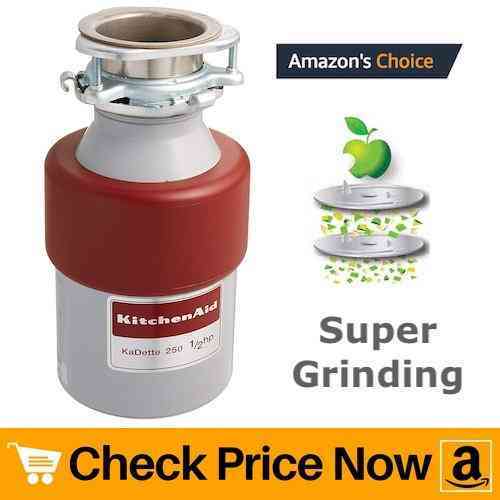 grind chamber capacity quickly grinds and gulps food scrapes. As a result, it saves your time as you can continuously keep feeding unit with waste food. Thus, making it a best badger garbage disposal. In case you need a replacement for your old badger 1, then this unit is powerful as compared to it. Also, quick-lock makes it fast and easy to switch out one insinkerator garbage disposal for another. Simply, twist off the old unit and fit the new one. However, if you’re buying this device for the first time, then all necessary components are present right in the box. This in turn, makes it easy for you to set-up device by yourself. And this easy installation makes it best insinkerator garbage disposal. Do not worry about product quality as its dura-drive induction motor delivers consistent performance. Also this motor is virtually maintenance free which in turn cuts down extra cost of maintaining the unit. Simply fit the device, throw in the food wastage and let the unit do rest of the work. 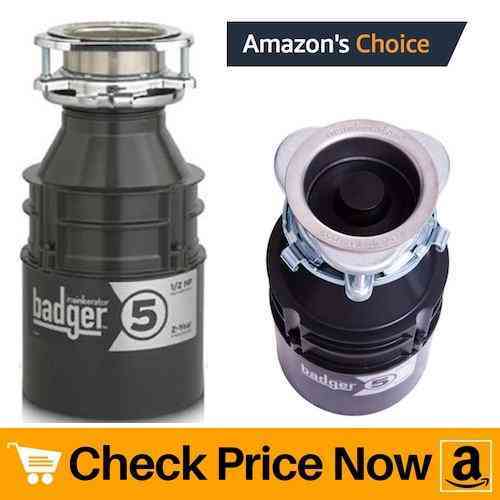 Its compact design yet powerful output makes it best badger garbage disposal. Bottom Line: Powerful dura drive motor and an excellent compact sink disposal for your house. It costs less than $100 and have more than 85% plus positive feedback from 4800+ customer reviews. 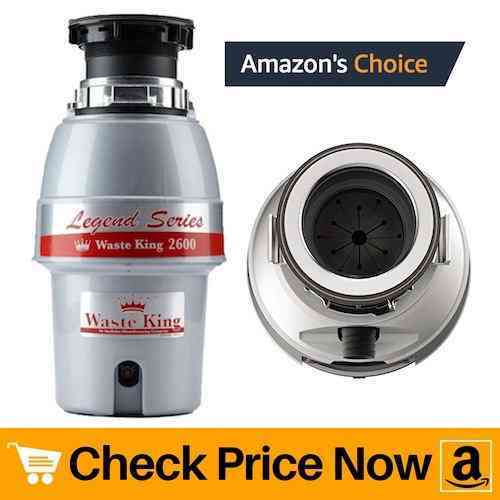 If you have a dishwasher at your home, then this waste king garbage disposal is just perfect. And if you are looking forward to buy dishwasher, then do check our best portable dishwasher reviews. This device from waste king include a dishwasher hookup in order to ease installation. Furthermore, its EZ mount system is super quick and easy to set-up. Not just that, waste king also offers removable splashguard for easy cleaning. And similar to most of the waste king units, basic idea about plumbing is enough for set-up of this model. Plus, they provide a video tutorial for more precise fitting of the device. Hence, which increases user comfort that makes it a best garbage disposal for the money. Its high-speed 1/2 HP motor can tackle everyday kitchen waste. Be it fruits, veggies, eggshells or celery sticks, this unit effectively churns every waste into fine pulp. Moreover, sleek design of this waste king garbage disposal saves lot of space under your kitchen sink. But above all, low prices of the device is what makes it one of the amazon’s choice product. Thus, it falls under the category of best garbage disposal under 100. Sturdiness is another attractive feature of this unit. And it gets all its sturdiness due to use of quality components. Its corrosion-proof polymer grind chamber is reliable as well as long lasting. Moreover, if you have proper size septic tank, then you can undoubtedly use this unit. 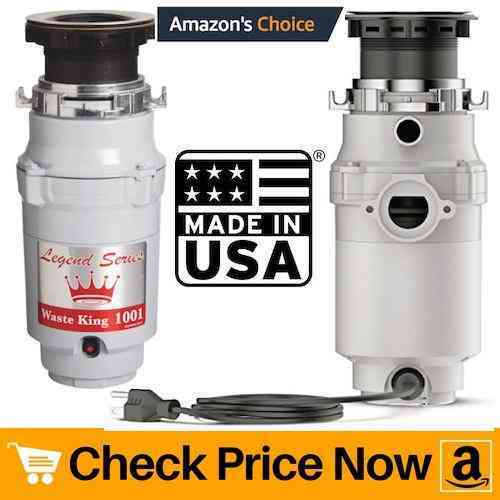 So overall, it powerful, durable and cheap garbage disposal from waste king. Bottom Line: Comes with a wall switch for on-demand ON/OFF. Easy installation, cheap price, and high speed motor has made Waste King L-1001 an high performance, reliable and affordable garbage disposal in the market. Okay, we know our best garbage disposal reviews till now flashes only two brands. So is there any other best garbage disposal brand apart from garbage king and Insinkerator? Of course, yes. This large capacity garbage disposal is best for families with 4-7 members. And with 1/2 hp motor, it quickly and finely grinds food particles, almost liquefying them. Benefit of such small grinding is, your sink will never clog again as well as all items goes right away into the pipe with the flow of water. All these features simply contribute in making it an ideal model for home in our best garbage disposal reviews. Its easy EZ mount installation with a removable splash guard and a stopper increases user comfort. While splash-guard eases cleaning of the unit, stopper prevents water and food particles from going down the drain. As a result, it becomes much more easy for you to use the product. And because of this reason, it stands as a best garbage disposal for the money. Speaking of its construction, stainless steel components of this unit are sturdy and long lasting. Not only that, it also includes dual-swivel impellers that mercilessly chops off food particles. Besides, a dishwasher drain connector makes it easy to connect device to your dishwasher. Total weight of 9 pounds is what further eases installation. Overall, it is a strong and best value garbage disposal for residential use. Bottom Line: GE are the king of making powerful motors and they have done it again in all together different segment. Over 2800 RPM grinding action you can a powerful kitchen sink food disposal from a top brand at a lower price. If you can’t bear irritating noise coming our from such units then here comes a solution. This insinkerator garbage disposal runs so quietly that you can hardly hear it while it is on. In short, this model is much more quieter as compared to standard units. Apart from being ultra-quiet, it delivers brilliant performance. And reason behind this excellence is its 1 HP motor. As it offers 1 HP motor, this insinkerator model is perfect for those who cooks regularly. 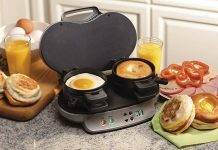 Also, it can handle food waste of more than 4 persons. All these credit goes to its high-efficiency motor which also makes it best garbage disposal for large family. The 3 grind stages breaks down food into so small particles that they easily flow away with water. And with such a fine grinding, forget about clogging of sink till this insinkerator garbage disposal is working. Apart from that, 40 oz. of grind chamber allows for large volume of food waste. And because of this large capacity you can churn down good quantity of food waste into minutes. Ultimately it saves your time by helping you to get rid of wastage fast. In case of tough jam, its jam-sensor circuit comes into action. This circuit automatically increases torque up to 500% in order to break through tough jams. However, it is not helpful in case of overloading. But to overcome problem of overloading, insinkerator garbage disposal provides a manual reset button. So overall, it is very durable unit worth buying. Bottom Line: They have really evolved the entire product. If you kitchen sink keeps getting clogged all the time then this is the garbage disposal you need. As our editor said, the ultimate drain cleaner! Here comes another waste king product on our best garbage disposal reviews. One major reason behind popularity of waste king’s products is its less price. Therefore, they offer all major features of an ideal garbage disposal and that too under budget. And this device is no less than a blessing for your kitchen sink. With 1 hp motor, this device will not spare any of the waste food items you feed it. Along with that, 2700 RPM churns anything from soft peels to thin bones. So keep cooking delicious food and leave the dirty job for this waste king garage disposal. 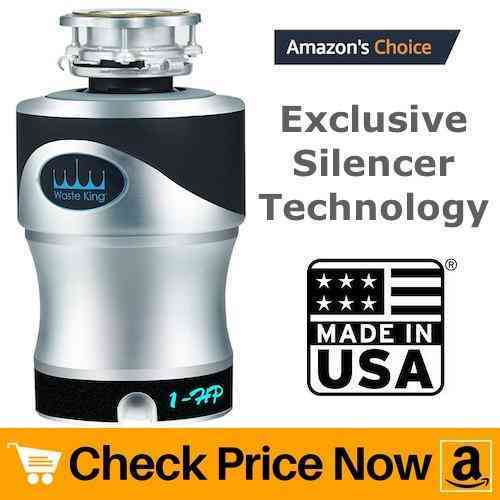 The device makes use of exclusive silencer technology in order to reduce noise. This technology uses materials same as that of used in sound-proof music studios. Therefore, it makes the device virtually sound-free. Moreover, unlike majority of units that feature 1,2 or 3 grinding stage, this unit posses one-pass technology. Hence, it eliminates need of multi-stage chambers and the motor powers through waste in one pulverizing pass. This less hassle makes it best value garbage disposal. What makes this waste king garbage disposal most interesting is its in-home lifetime warranty. Whenever your unit develops a material or mechanical defect, it will get replaced. Further, the device also comes with a lifetime warranty against corrosion. Conclusively, it is a compact, powerful and durable product for heavy residential use. Bottom Line: Comes with easy snap and mount feature that helps in fast installation. High performance motor directly pass the waste food in one go from pulverizing pass (sink pipe). Modern design with top brand backing this unit make it a lucrative buy for sure. Moving ahead, we have a small yet powerful product on our best garbage disposal reviews. Moen’s high-speed vortex motor is what makes it different from other brands. This vortex motor is powerhouse behind its exceptional grinding capacity. So how does this motor work? Well, it takes up full speed the moment you turn on the power. This is possible because of the permanent magnet motor. And with speed of up to 2600 RPM, it can churn any waste food substances into seconds. Also, high-efficiency motor along with decent speed reduces probability of jamming. Thus, which makes it best garbage disposal for home use. In order to reduce hassle while installing the unit, this moen garbage disposal features universal express mount. This mount is compatible with most of the 3-bolt mounting system. Simply position the device, twist and lock in into place. And there you are, ready to throw kitchen waste inside the unit. Not to worry about space, as small size of the unit does not need much space. In fact, you’ll have plenty of room to fit other objects under under kitchen sink. 7/8″ dishwasher connection size makes it easy to install unit with a dishwasher. Also, you do not have to buy any cord separately as moen includes in-built power cord. Moreover, its soundsheild technology helps to minimize sound coming out from its powerful motor. Therefore, you get all benefits of a garbage disposal under budget which makes it worth the money. 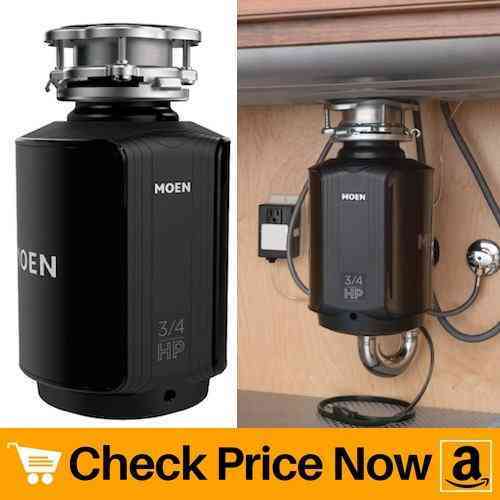 Other than this model, moen also offers high hp motor for heavy usage, namely, 1 HP and 3/4 HP garbage disposals. Bottom Line: This Moen unit won our heart because it comes with pre-installed power cord which does not cost you anything more than the price of the unit. It comes with varying motor power and 4 year consumer warranty. 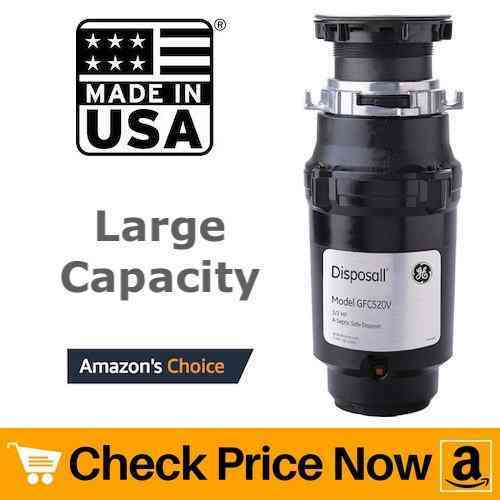 Just enough offers that you should not pass this high performance garbage disposal in the market. Kitchen waste from small family does not necessarily need a product having great horsepower. And if size of your household is small, then this kitchenaid garbage disposal exactly fits your purpose. With 1/2 hp motor, it can continuously grind kitchen food wastage in seconds. In addition to that, motor rotates at 1725 RPM that makes sure no large food particle enters septic line. And when there are no chances of food getting stuck in the pipe, it automatically prevents clogging of sink. Therefore, this feature makes it best kitchen garbage disposal. When you’re looking an electric unit for home use, budget is the main concern. But not to worry as this kitchen aid unit is not heavy on your pocket. In fact, it falls under the category of best garbage disposals under 100. 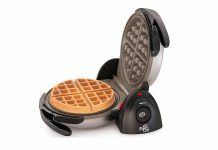 Furthermore, the device includes an electric switch which in turn makes operating it fast and safe. Once you start putting all the kitchen waste into the sink, turn on the kitchen faucet and the device. Now watch all the garbage disappear in minutes. If you live on rent or in a RV, then you seek units that are compact, portable and powerful. Sometimes you come across devices that provide excellent output but are large in size. But what if you a get good performing product with a space saving design? And with the same motive this kitchen aid model is best garbage disposal for small spaces. It is small, light in weight and durable. Bottom Line: Continuous feed allows for quick cleanup after meals. If you are looking for a compact disposal then this is the best pick for you at a affordable price. Good performance at very affordable price. If you don’t cook at home regularly then you might not need a costly unit. In fact, a device with decent horsepower will work fine. 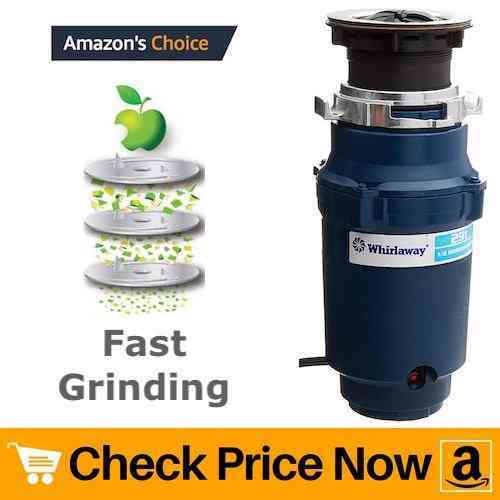 So here we present you an amazing product from whirlaway on our best garbage disposal reviews. This device posses 1/2 hp motor that is powerful enough to tackle normal kitchen waste. 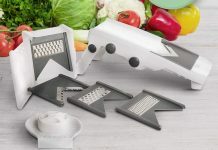 Therefore, it can grind small bones, vegetable peels, lemon skin, etc in seconds. Apart from that, small size of product is ideal to use it in small spaces such as RV or boat. And as it has a compact design, it will save a lot of space under your kitchen sink. Thus, it is a best garbage disposal for small spaces. Design of the blades is such that it reduce impeller jams. In case you experience any type of jam in future, you can solve it using a wooden dowel. Simply insert the wooden dowel into the unit and rotate it around the ring. Doing this will remove particle jamming the system and your device will start working again. Otherwise, stainless steel impellers are sturdy as well as long lasting. For easy cleaning of the unit, this small garbage disposal offers splash guard technology. And for easy set-up, it offers a unit instruction guide. If you have somewhat knowledge about plumbing then installation this device is no big deal. Just gather all necessary things for proper installation and it will take hardly 30 minutes to make it start. This ease of set-up makes it a best compact garbage disposal for RV’s and boat. Bottom Line: They are proud to say that Whirlaway units are 100% Made in USA garbage disposal. This insures that its built quality is high and product quality has not been compromised. In less than $100, this made in USA unit can clean your sink pipe easily. No one likes to work in an environment with a constant irritating sound coming out from an electric device. So next on our best garbage disposal reviews we have an ultra-quiet product from insinkerator. Despite of offering 3/4 horsepower motor, the device works so quietly. And with such a great power you can grind veggies, fruits, leftovers and even small bones of fish. Even when the unit is churning kitchen waste, you can hardly hear humming of the motor. Thus, it is a best insinkerator garbage disposal for those who hate working in continuous irritating noise. 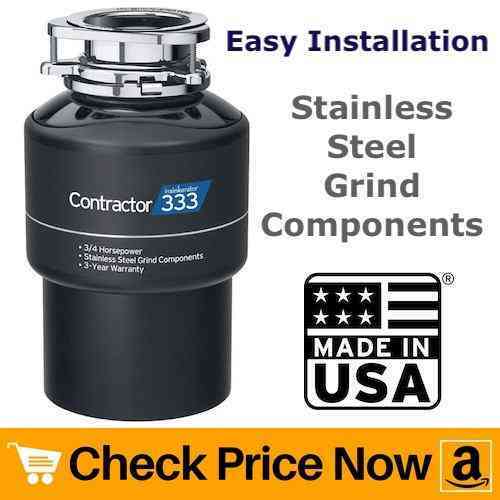 Do not worry about product quality as steel components of this insinkerator garbage disposal will last for years. In fact, this model is choice of 9 out of 10 plumbing professionals. Also, it is one of the ‘best choice’ products on amazon. Both these facts indicate that components of this product are of standard quality. Thus, it is a best garbage disposal for the money. For quick and easy installation of the unit, insinkerator offers a quick lock mounting system. In case you already have a disposal before and need to change it, then this product is the best alternative. Simply remove the old unit, place this model into the position, twist it and lock it. And your brand new insinkerator garbage disposal is ready to grind kitchen waste. Bottom Line: It has quick lock mounting for fast, easy installation which makes your life easier. This InSinkEractor unit has stainless steel grind components that can grind almost any food waste your clean in your sink. 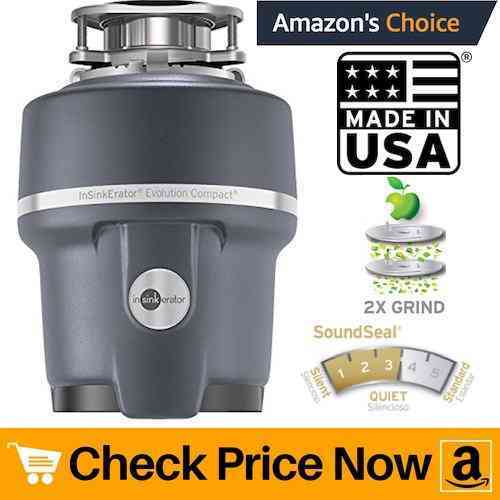 Next on our best garbage disposal reviews we have a product ideal for people who do not cook regularly. With 1/2 HP motor, this Whirlpool garbage disposal can grind almost any type of kitchen waste. Be it fruits, vegetables, peels or soft bones, it can churn all of them in a snap. As the product churns food particles fast, it ultimately saves your time. Moreover, people who often buy food from outside does not need to invest in costly device. And this product from whirlpool is perfect for them as it is not too expensive. In fact, less price of the device makes it best garbage disposal under $100. The whirlpool garbage disposal comes with 1 piece plastic stopper so that you can finish all your sink activities properly. After you’re done with the dishes, simply remove the stopper and let all small food particles go inside the unit. Once all small food items pass through the device, now its time for comparatively big food particles. Its stainless steel sink flange will gulp kitchen waste in minutes. In case of overloading, Whirlpool provides an overload protector with manual reset. Just press this button to readjust impellers and make the unit start again. Other than that, it is easy to install the unit as it features a side handle. However, heavy weight of the product may make it little bit difficult to install it all by yourself. Otherwise, it is a decent and cheap garbage disposal with a powerful performance. Bottom Line: Whirlpool is a very popular brand in home appliances and they have now entered the market of kitchen cleaning. GC2000XE has continuous feed system which keep disposing the food waste while your are cleaning your dishes in the sink. Its worth giving a shot if you have already used other brand products. Second last on our review list, we present you a best rated garbage disposal from Moen brand. Its 3/4 hp motor is powerful enough to tackle almost all sort of kitchen wastage. And with a grinding action up to 2700 RPM, it will mercilessly churn food wastage into tiny particles. Therefore, this much grinding power along with powerful motor is best for medium to large size family. Furthermore, vortex motor helps to reduce jamming of the system. And less jams means fast working. Besides, rather than inserting food particles into batches you can feed them continuously into the device. This is possible because of Moen’s continuous feed system. Thus, fast working of this device makes it best garbage disposal for the money. 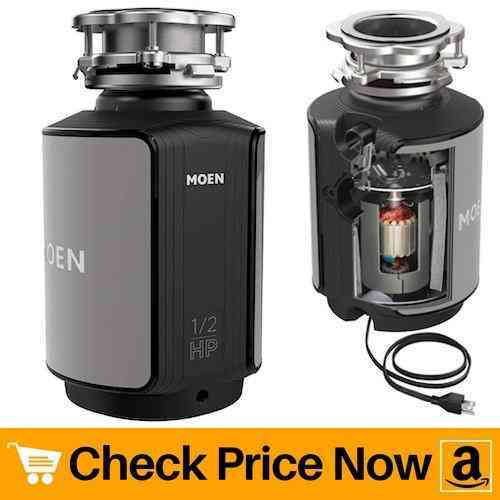 This Moen garbage disposal is safe to use with proper size septic tanks. Moreover, installing the unit is a breeze because of its universal express mount. Therefore, it fits all Moen and existing 3-bolt mounting system. It even includes a power cord so that you do not have to buy it separately. Simply position the device underneath the sink, twist it and lock it into place. And there you are, ready to start grinding session. In order to reduce irritating noise, Moen garbage disposal includes sound isolation system. This system helps to deaden sound levels coming from the motor while its grinding. Apart from that, despite offering such a powerful performance size of the unit is small. And due to its compact design it saves a lot of space inside your kitchen cabinet. Conclusively, it is a product worth buying. Bottom Line: It belongs from the Moen GX series of top garbage disposals. 3/4 HP motor is the ultimate destroyer of food waste. Soft or hard waste it will grind them all. Professionally designed to reduce jamming of the skin pipe. Fairly priced and became Amazon choice product due to good customer reviews. Food waste go right in the sink – where they’re virtually liquefied to safely flow into your septic tank. 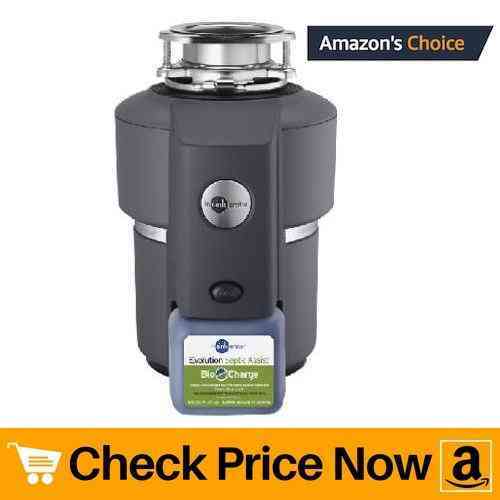 You might be wondering what is so special about the brand Insinkerator that it dominates our best garbage disposal reviews? Well, the reason behind it is its quality. So what makes this product different from rest of Insinkerator garbage disposals? This unit is specially designed for homes with septic systems. Homes having septic tank system usually find it hard to buy a perfect unit as most of them do not support such systems. But this Insinkerator septic tank garbage disposal is solution for such homes. Its 3/4 hp motor is powerful enough to grind chicken bones, fruit rinds, coffee ground, etc in a snap. Thus, it is a best garbage disposal for septic system. 2 grind stages thoroughly grinds food particles. In addition to that, sturdy impellers along with grind ring almost liquefy the kitchen wastage. And benefit of such fine grinding is, your sink will never clog as long as the product is working fine. Also, you can add difficult foods such as celery and potato peels which is not possible with standard disposal. All these qualities simply makes it best Insinkerator garbage disposal for septic tanks. The unit works 40% quieter as compared to standard models. All thanks to its soundseal technology. 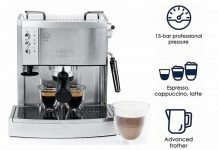 Apart from that, 40-ounce of stainless steel grind chamber handles huge amount of kitchen waste in single go. So do not worry about amount of kitchen waste as this insinkerator garbage disposal will churn waste in seconds. Overall, it is powerful yet compact device ideal for homes having septic system. Bottom Line: It is a septic garbage disposal from InSinkErator with good reviews. Completely made in USA and worth buying. It can grind all, chicken bones, fruit seeds, coffee ground and more. 1. How to clean garbage disposal? Cleaning a garbage disposal is no big deal. Also it is important to clean garbage disposal in regular basis as it eliminates odor coming from it. Apart from removing bad smell from the garbage disposal, cleaning also helps to prevent clogging of unit. So without wasting much time let is focus on 4 different methods of cleaning a garbage disposal. First of all grab a pair of tongs, torch and kitchen sponge before beginning cleaning process. Then after, make use of torch to see if anything is stuck inside the grind chamber. If yes, then carefully remove that object using tongs. Using kitchen sponge, scrub through and under the baffle. Avoid putting hand into the disposal as it contains sharp blades. Only make use of stick sponge to clean components inside the grind chamber. Once you clean all the parts thoroughly, turn on the kitchen faucet and let the water pass through the device. Keep the faucet on for 2-3 minutes. Making use of hot water is more beneficial as it will wash away grease or oil from inside the unit. In case you looking forward to buy a water heater, do check our reviews on best electric tankless water heater. This method is best alternative to manual cleaning of garbage disposal. Before beginning to clean the unit, you will require 8-10 ice cubes and 2-3 tablespoons of rock salt. First, fill the unit with ice cubes and then pour rock salt over it. Now turn on the faucet as well as disposal. Keep the device on for few seconds with the water still on. After 40-50 seconds, turn off the device. Doing this removes debris from inside the unit as well as ice sharpens blades. No one likes to work around a smelly place. And nothing works better than citrus peels to remove bad smell from a garbage disposal. Also it is natural way to remove odor. For removing odor, you will need peels of citrus fruits. It can be lemon, orange, lime or grapefruit. Add the peels inside the grinder and turn on the unit for few seconds. Other than removing odor, these peels will also clean blades. 2. How to install a garbage disposal? basic knowledge of plumbing is enough to install a garbage disposal by yourself. All you need is some tools and plumbers putty to start installation. Go through below points to make installation of garbage disposal a breeze. Before beginning steps for installation, let us focus on tools and other things you might need for set-up. Step 1: Turn off power to avoid any electrical accidents. Then after, place the bucket underneath the sink and disconnect drain pipes. 3. How to unclog a garbage disposal? Though a garbage disposal does not clog very frequently but due to some reason it might clog. It can be due to big food particle or insertion of something else other than food. However, you should never insert plastic, metal or any other objects other than food into your garbage disposal. And in order to maintain the device, you should clean it once every 6 months. But for now let us focus on how to unclog a garbage disposal. Step 1: Turn off the power switch and grab a flashlight. Using the flashlight take a look inside the disposal. See for the object that is causing blockage. Step 2: Once you see the object, remove it safely using pliers. Be very careful as you do not want to damage the blades. Step 3: Now manually turn the blades with the help of a proper wrench. Doing this will remove debris as well as let you know if there is another object stuck inside the chamber. In case you find another object repeat step number 2. Step 4: Turn on the power supply and see of the device is working properly. If yes, then debris is successfully removes. But if it is not working properly, then you might need a plunger. Before making use of plunger, turn the power switch off. Step 5: Fill the sink with little water, place the plunger over sink hole and apply a little pressure. Once the plunger sticks properly to the sink start plunging. Doing this will uplift debris or food particles present inside the grind chamber. Then after, remove those particles with hands. Step 6: Wait for 15-20 minutes before turning on the motor. Now turn on the motor and kitchen faucet and let the water flow for 2-3 minutes. This will remove tiny debris and food particles present inside the grind chamber. Thus, you can now use your garbage disposal for grinding. Leaking of garbage disposal is common complain after years of using the unit. And if your device is more than 8-9 years old, you might need a new one. And our 15 best garbage disposals will definitely get you perfect product. Issue of garbage disposal leaking from bottom is mainly due to broken seal inside the grind chamber. There is nothing you can do about fixing the seal as it life is almost getting over now. Even if you wish to fix the seal, it will cost you almost same as of buying a unit. So in our opinion, rather than fixing the internal seal, go for a new product. A new product will last for 8-10 years which is good for the amount you will pay. And if you have confusion about what type of disposal should you buy, check out our best garbage disposal reviews once again. You’ll surely get for what you’re looking for.